£1/euro operated baggage trolleys are provided. They are available in the short stay car park adjacent to the train station and pickup and drop off area. They’re also available in all carparks and in the baggage arrivals area. Trolley return bays are available at check in and in all car parks. In departures, all of our eating and drinking outlets have plenty of power sockets to enable you to charge your devices and keep you connected. There are a number of parking options available at LondonSouthend Airport all of which are just a few minutes’ walk to and from the terminal. You can pre-book your parking to guarantee a space at the best price or just turn up on the day. You can find out more about parking at London Southend Airport on our parking pages. Our car hire provider Europcar, are based in the arrivals area in the terminal building. For more information and booking please visit our car hire page. Inside the terminal building adjacent to check in and in the arrivals area. Behind the Moneycorp bureau de change on the lower level of the departure lounge. Are you a connecting passenger? There is only one terminal here at London Southend so on landing please follow the standard arrivals process and then head to check in/departures. Our foreign exchange provider is Moneycorp, you can find their bureau de change outlets in the arrivals area (before security) and on the lower level of the departure lounge (after security). To find out more or to pre order your currency visit Moneycorp on our website. Details about the food and drink offer available at London Southend Airpot are available on our website. You can relax before or after your travels. the hotel is brilliantly located just a few minutes’ walk from the airport terminal and train station. Book your stay today. If you lose items whilst you are at the airport or you discover you have lost items once you have left the airport, please complete our lost property enquiry form. Lost property enquiries will be responded to within 24 hours. If you discover you have left an item on your departing flight, please contact the lost property at your destination airport. The Skylife Lounge can be found in departures, relax in style by booking in advance. Skylife lounge currently accepts Priority pass, Dragon pass, Diners pass, Lounge key & Lounge club, where capacity allows. For full information or to make bookings in advance visit our SKYLIFE Lounge page. If you feel unwell please alert any member of staff, who will arrange for a qualified first aider to take care of you. If you’re meeting someone at the airport we recommend you head to the shopping, eating and seating areas at arrivals. To pick up and drop off as close to the terminal as possible, please use our Short Stay Car Park, located opposite the terminal. This has 5 minutes free. There is also a free pick up/drop off option in Long Stay 3, just a couple minutes’ walk from the terminal where you can park free of charge for up to 15 minutes. For more information on picking up and dropping off please our Parking page. There is a post box located inside the terminal building adjacent to check in, opposite the main entrance to the airport. Additional collections may be made throughout the day until the last time shown. Our quiet room provides a restful place for passengers of all faiths and denominations and is located next to the ticket desk in check in area, before security. Want to bypass the risk of long security queues? You can purchase fast track now. Discover the shopping offer available at London Southend Airport. Explore how you can collect your heavy/large or more premium items on return from your trip from World Duty Free. In line with UK law, smoking (including the use of electronic cigarettes or vaping) is not permitted inside the airport buildings and walkways. You will not be able to smoke once you have passed through security in the departure lounge or when travelling to or from the aircraft, in the walkways. There is a designated smoking area outside the front of the terminal. If you require special assistance while at the airport please inform your airline at least 48 hours before you fly. It is best to give as much notice as possible both for your outbound and return journeys so we can make the arrangements to give you the assistance you require. If you arrive at the airport and haven’t booked in advance we will make all reasonable efforts to assist you. Please head to the special assistance desk located opposite the terminal entrance. For more information, visit our special assistance information pages. The terminal is open daily from 04:00 to midnight. There are plenty of toilets, wheelchair accessible toilets and baby changing facilities conveniently located throughout the terminal building, both in arrivals and departures. Our taxi provider can be found immediately outside the front of the terminal, where a taxi marshal can assist your onward journey. For more information and to book taxis visit our Taxi page. 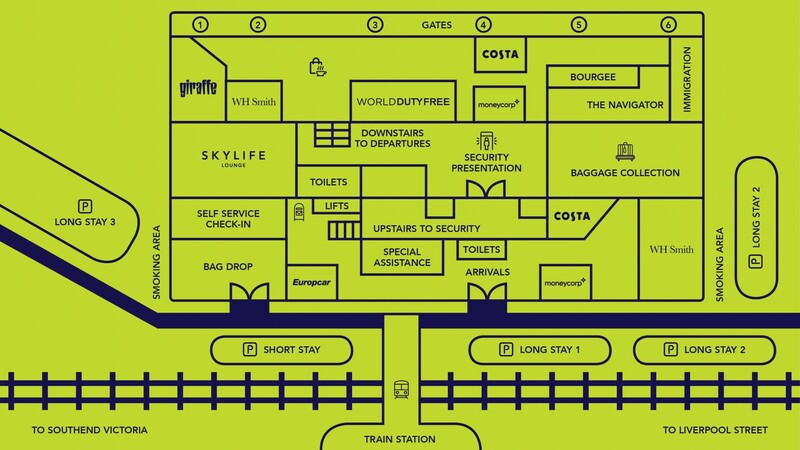 London Southend Airport has its very own station with convenient links to central London, the railway station just 100 steps from the terminal. Turn right at the main exit and you’ll see the station directly ahead of you. Find out about journey times, timetables and fare information on the Trains page of our website. The X30 bus operates from the bus stop immediately outside the front of the terminal. Arriva buses operate from the bus stop located outside the Holiday Inn, a 7-minute walk from the front of the terminal. Find out journey times, timetables and fare information are available on our website. Please head to the ticket desk where a member of staff will contact UK Border Force on your behalf. Free WiFi available throughout the terminal to help you stay connected. Just select London Southend Airport Free WiFi and follow the on-screen instructions. Once registered, you’re connected!